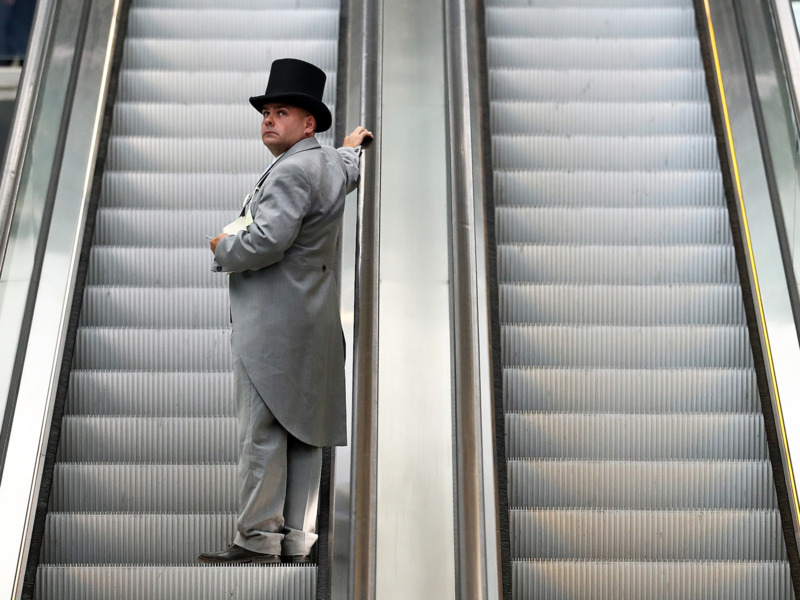 Bryn Lennon/Getty ImagesIt’s a slow and steady climb to the seven-figure club. 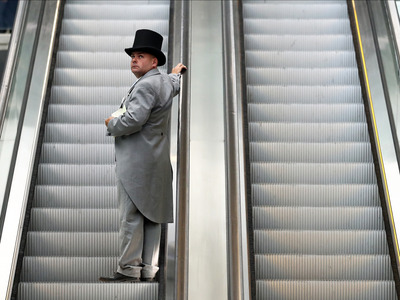 Sean, who goes by “The Money Wizard,” is a 28-year-old blogger and financial analyst. He grew his net worth by more than $US100,000 in two years and is on track for an early retirement. 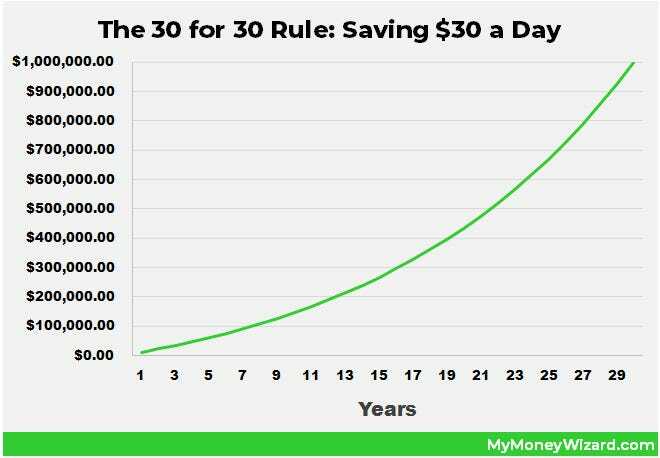 Sean found that one of the best ways to start building wealth is to save small amounts of money every day – he started by saving $US5 a day and is now saving about $US100 a day. His calculations reveal that if you save and invest $US30 a day, earning a 7% rate of return, you can be a millionaire in 30 years. One of the first finance books I ever read was David Bach‘s Automatic Millionaire. In it, he explains the idea of The Latte Factor. The Latte Factor is the concept that tiny amounts of money could add up to huge amounts of savings over time. True to the name, the classic example is a $US5 cup of coffee each morning. As David explains, if that same $US5 was instead invested and earned the stock market’s historical return of 7% per year, our luxury coffee drinker would have an extra $US1,953 after just one year. I immediately found the idea fascinating. And as a money blogger chasing total financial freedom, of course I wanted to figure out how much I’d have to save per day to reach my ultimate goal: a $US1 million dollar portfolio and an early exit from the rat race. All it takes to become a millionaire is to save just $US30 a day (that’s assuming the stock market’s historical 7% rate of return). Over and over again. But $US30 a day? Anyone can save $US30 a day! 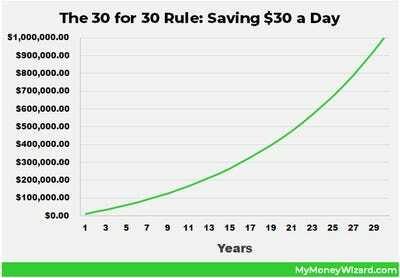 $US30 a day is as simple as passing on a dinner out, driving a cheaper car, or even working a couple extra hours at a low-paying job. And if cutting back isn’t your style, I just finished a step-by-step strategy showing how anyone can side hustle an extra $US11,207 next year. What do you know… that’s a perfect $US30.70 a day! I started out inspired by the idea of saving $US5 a day. Before I knew it, I’d upped that saving to $US10, then $US20 a day. So I started cutting costs where I could, and working relentlessly to increase my income. Before I knew it, I was saving $US40, $US50, and $US60 a day. And last year? I saved a whopping $US35,000. That’s nearly $US100 a day.